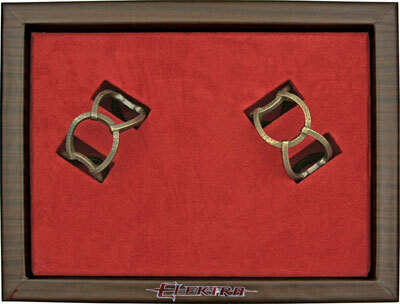 Officially licensed Elektra Sai Set Wishing Well Display for sale. These are the officially licensed movie replicas. The armbands of Elektra sums up the character in one word "Assassin." 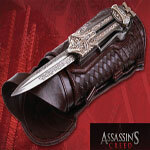 buy an exact replica of the armband worn by the legendary assassin Elektra played by Jennifer Garner. 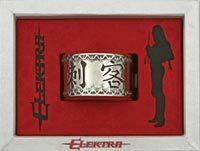 The Elektra Movie Bracelets worn by Stone. This is an exact replica of the bracelets worn by Stone (Played by Bob Sapp). 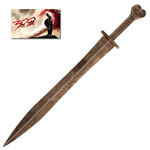 This wearable collectible is crafted in steel; this piece is detailed with a bronze finish. This is an officially licensed product that is a limited edition of 2500. Item item includes an autographed picture of the character Stone (Bob Sapp) and a certificate of authenticity for only $29.99. Elektra was a martial arts prodigy and a mercenary for hire. The Elektra Armband sums up the character in one word "Assassin." 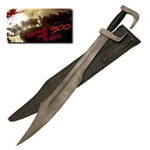 This is an exact replica of the armband worn by the legendary assassin Elektra (played by Jennifer Garner). This wearable collectible is crafted in stainless steel with an adjustable leather arm-strap; this piece is detailed with ancient symbols. This is an officially licensed product that is a limited edition of 1500. 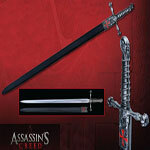 Item is serialized and includes Certificate of Authenticity for only 69.99. Sai Set of Elektra: Elektra Wishing Well Display is almost two feet high at 22" and weighs almost 17 pounds. This large display detailed display set commemorates the epic battle fought between Elektra and Kirigi. This is a Scaled reproduction of the wishing well seen in the final climatic scene. Item is made of cast resin construction with detailed brick work. 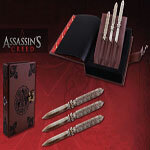 Also includes two authentically replicated detailed stainless steel sais with oriental calligraphy engraving. This is an officially licensed product. It is a limited edition of 2500.